The Perth Mint introduced the new annual Australia’s Remarkable Reptiles series with the release of the 2013 Frilled Neck Lizard Silver Proof Coin. This coin is struck from one ounce of 99.9% pure silver and features a limited mintage of 5,000. Shown on the reverse is a colored image of a Frilled Neck Lizard. 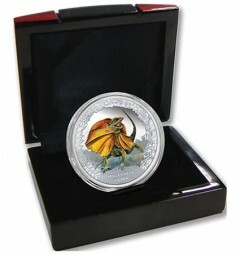 Subsequent coins in the series will continue to showcase additional reptiles indigenous to the Australian continent. The Frilled Neck Lizard is the only member of the genus Chlamydosaurus. The lizard is relatively large with an average length of 85 cm and is easily identifiable by the frill of skin located around its neck. "When this unique creature feels threatened, it extends the frill around its neck like an open umbrella," explains the Perth Mint of Australia on the coin’s product page. "Frilled Neck Lizards are members of the dragon family that live in the tropical and warm temperate forests and woodlands of northern Australia. They spend most of their lives in the trees, but descend occasionally to feed on ants and small lizards." Generally, the male of the species can be differentiated from the female by their size. Males tend to be much larger. The coin’s reverse depicts the Frilled Neck Lizard in its defensive stance complete with an outstretched frill. Bordering the design is a montage of exotic reptile skin patterns. Inscribed below the image is FRILLED NECK LIZARD. These coins are struck as legal tender of the island nation of Tuvalu. As such, the Ian Rank-Broadley effigy of Her Majesty Queen Elizabeth II graces the obverse. Obverse inscriptions include QUEEN ELIZABETH II, 2013, TUVALU, the legal tender face value of 1 DOLLAR and the composition of 1 oz 999 SILVER. Specifications of the coin include a diameter of 40.60 mm and a maximum thickness of 4.00 mm. The minimum gross weight of each piece is 31.135 grams. A wooden presentation case accompanies each coin along with an illustrated shipper and a numbered Certificate of Authenticity. Those interested in purchasing a 2013 Frilled Neck Lizard Silver Proof Coin may do so directly from the Perth Mint of Australia (www.perthmint.com.au). Initial pricing is listed at AUS $97.27, or US $99.74. Pricing is subject to change based on the market conditions of silver. I purchased 2 of these coins. I think they are beautiful, The color of the lizard fits right in on the coin. ( not a snap shot picture ). This of course is the 1st piece of the series.